Another annual Psychonomics Society meeting has come and gone. This years event took place in New Orleans, Lousiana from November 15-18th. Blake Elliott presented a poster about value directed encoding and retrieval. His poster was nominated for and won APA Division 3’s Poster Contest. Post-doc Matthew Robison and graduate student Derek Ellis both presented posters. Lab alum, and graduate students, Peter Whitehead (Duke) and Anne Vogel (University of Mississippi) shared posters as well. Lastly, Hunter Ball (University of Texas: Arlington) helped close out Psychonomics with by giving a talk about his recent work on prospective memory. Fantastic group of individuals putting in the effort to understand and reduce hot car deaths. This past week representatives from Weather.com came to Arizona State University and interviewed several researchers that study various aspects of hot car deaths for an upcoming documentary. Our laboratory researches cognitive failures leading to prospective memory errors. Prospective memory is defined as one’s ability to remember to complete intentions in the future. Many hot car death situations involve a parent or caretaker having a prospective memory failure and forgetting their child. Therefore, understanding the nature of these failures can help avoid tragedies and save lives. Nice work team! Also , check out the incredible work on this topic from Jennifer Vanos in our School of Sustainability. Jennifer studies heat and how it affects the human body. 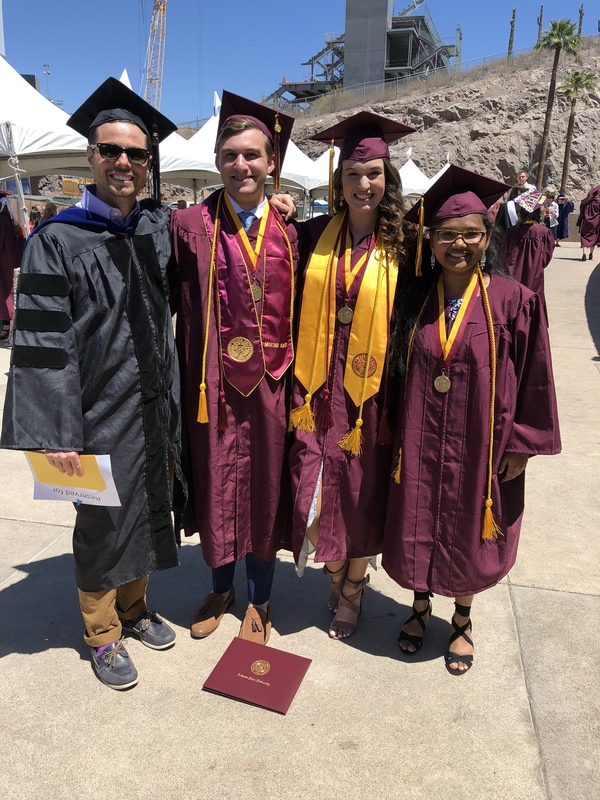 With the closing of another great academic year we want to take a moment to say congratulations and highlight some of our graduating honor students. The three students we seek to honor are Aaron Cohen (second from left), Mohitha Obulasetty (right), and Krysten Sullivan (second from right). Aaron’s honors thesis examined how motivation influences problem solving accuracy and metacognitive monitoring and control processes during problem solving. 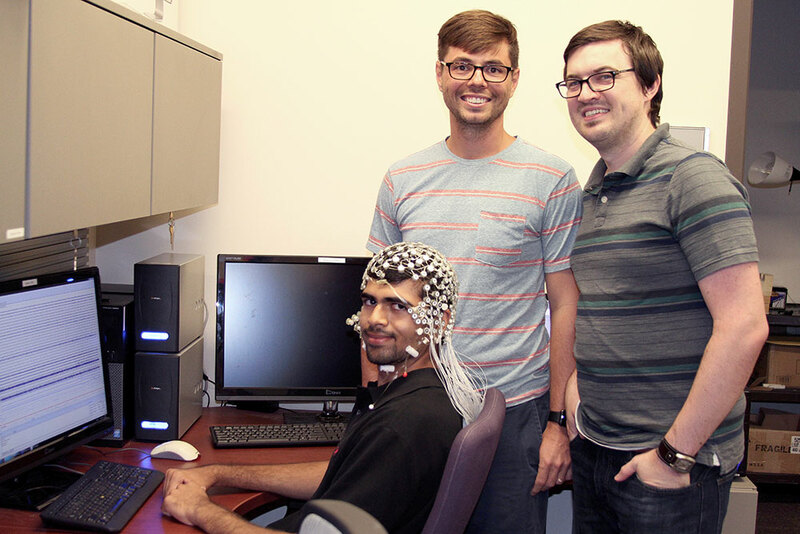 Mohitha’s honors thesis examined how binaural beats augment sustained attention. Mohitha’s thesis was the first preregistered honors thesis from the MACLab! Krysten’s honors thesis examined how different confidence scales impacts recognition memory decision-making using signal detection parameters d’ and c.
Last week local evening news reporter and weather anchor Kristy Siefkin visited the Memory and Attention Control Laboratory to talk with Gene Brewer about the Mandela Effect. 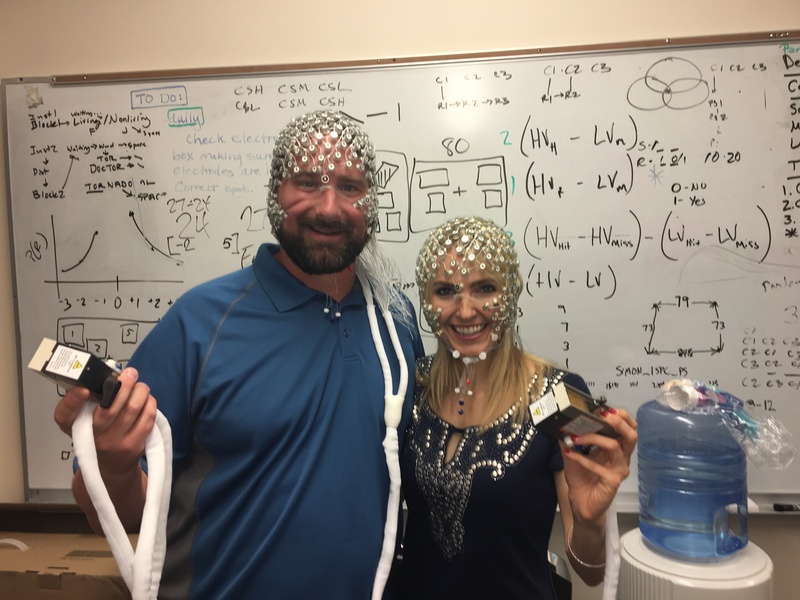 This post will be updated with the video segment after it airs, but in the meantime here are Kristy and Brian Kae of Fox 10 news wearing our new 256-electrode EGI caps. Update 7/27/2017: The segment aired on 7/24/2017 and here is a link to view the segment and write-up. With the most recent publication from the MAC Lab, we wanted to quickly post access to the data from the article. Below are a link to a pdf of the publication and an Open Science Framework link containing the data and tasks used in the experiment. Brewer, G. A., Lau, K. K. H, Winger, K. M., Ball, B. H., & Blais, C. (2017) Examining depletion theories under conditions of within-task transfer. Journal of Experimental Psychology: General, 146(7), 988-1008. For those who missed our posters at Psychonomics or wanted a copy for themself, here they are. Thank you to everyone who swung by and took the time to talk with us. As the Summer semester draws to a close, we wanted to take a moment to highlight our intern Rohan Tripathi. Rohan, a local high school student, spent the summer working with us on a variety of projects and presented findings at the Banner Sun Research Institute Intern poster session. To read his full story follow this link.